Beyond the Beltway with Bruce DuMont began in 1980 as a 13 week experiment on WBEZ-FM public radio in Chicago. Initially the program was called Inside Politics, a weekly political discussion show featuring four guests – – two left of center and two right of center. The program was the first to offer a spirited, robust, knock down drag out discussion of politics. The format is now a staple of cable television. After developing a cult following and critical acclaim, the program was eventually discovered by national public radio programmers and in 1991 was launched intonational syndication with 13 stations. But in 1992 the program switched from public radio to WLS-AM Radio/Chicago — and it’s national profile grew on commercial radio – – becoming a Sunday night beacon for political junkies. It became the meeting place for politically astute listeners every Sunday night where they could react to the official Washington-based talking heads Sunday morning shows. The switch to WLS was followed by an expansion of the affiliate base to over 50 stations, including many state capitals ( Sacramento, Austin, Boise and Springfield) as well as New Hampshire and Iowa. Starting in 1980, during presidential campaign years, the program began a tradition of originating from different states around the nation – – following the political primary schedule. 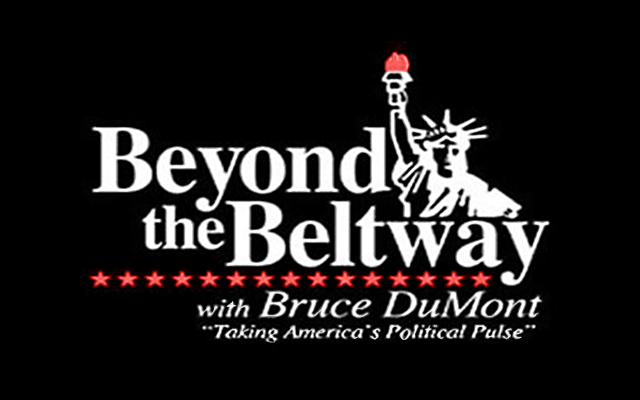 Following the Republican take over of Congress in 1994, the program title was changed to Beyond the Beltway– a term used on the very first national show in 1991. Beyond the Beltway is not only the title of the program — it is the philosophy of the program. I have felt since young adulthood that too much of the national political debate was dictated by a small group of arrogant “inside the beltway types” who gathered on the banks of the Potomac River to decide political policy – – with little regard for those living beyond the beltway – – in real America. The insular nature of television media analysis is predictable and not very forward thinking – with some conservative commentators like their liberals counterparts content with dishing out the party line with little regard for fresh ideas or outside input. Today Beyond the Beltway is heard on 35 stations from coast-to-coast, including Sirius-XM satellite radio (POTUS Channel 124). The program is now in its eighth year on satellite radio. In Chicagoland the program recently joined the lineup of of WCGO-AM1590. It was at AM 1590 in Evanston where my on air radio career began in 1973, following my career as a producer at WGN radio, where in 1968 I was the original producer of Extension 720. In 1996 the television version of Beyond the Beltway was introduced to Chicago viewers. It now airs at Midnight every Sunday night on WYCC-TV 20— and seven times a week on Channel 100 on the Chicagoland Comcast cable systems. In 1999 the program gained icon status as an answer to a $500 question on Jeopardy. In March 2015 the program expanded again – – initiating a live video and audio stream from 6 to 8 PM (CT) on beyondthebeltway.com as well as YouTube and Vimeo. Beyond the Beltway is a national radio program, a local Chicago public television program, a Comcast cable program and a live video streamed Internet program now seen worldwide. Utilizing all platforms the show presents a balanced view of national politics, featuring guests left of center, right of center and libertarians in between. The program has never relied heavily on big-name newsmakers nor media pundits, but they do appear from time to time. An advertising association with the program would give a sponsor access to a politically astute audience from around the nation every Sunday night who enjoy thoughtful robust balanced political discussions. Sponsorship packages and spot sales are available on all platforms, commercial radio public television, commercial Comcast cable television in Chicago and Internet banner advertising and spots. In 2016 I will seek to expand the program further on public television – – offering it’s one hour version to public television stations and commercial Cable systems throughout the country. Beyond the Beltway is an established and respected brand in American broadcasting – – and an advertising association with the program and myself could be beneficial to any company seeking mature, educated, engaged decision makers and business leaders. The hallmark of the program for 35 years has been fairness and balance – – – a philosophy that predates the Fox News slogan by 20 years. But fair and balanced is not a slogan of my program – – it is my philosophy.